Rain Taxi's Chapbook Corner says From Orange to Pink brings "some joy back into the quotidian fray." 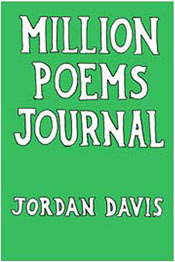 Stephen Burt called Million Poems Journal "very personal, very appealing" in the Boston Review. Ron Silliman said of MPJ that "The sun hasn’t shined more brightly on New York City since the early poems of Frank O’Hara." Susan Wheeler introduced a suite of my poems in American Poet, a publication of the Academy of American Poets. 2012: a poem in Open Letters Monthly. 2011: poems in A Public Space, The Laurel Review, Fence and New England Review. 2010: poems in Agriculture Reader, Everyday Genius, The Awl, Columbia Poetry Review, Sixth Finch, 1913, Passages North, Nuova poesia americana - New York, West Wind Review and Zoland Poetry. 2009: poems in Court Green, The Brooklyn Rail, Ploughshares, Handsome, Poetry, Lana Turner, Boxcar Poetry Review, Copper Nickel, The Nation, Ping Pong, Poetry, H_NGM_N, Pleiades, and A Best of Fence Vol. 1.